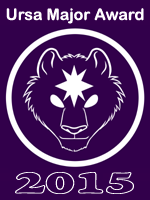 Voting for the 2015 Ursa Major Awards has come to a close. This year Savestate came in second! That’s amazing for a webcomic in it’s second year! Thanks to everyone who voted! Voted for you! Your comic is one of my favorites. I love its artistic style, jokes and especially the occasional animations! I was on yesterday voting for Sofurry as best furry site when I noticed Savestate was one of the comics listed for best comic so I voted for you. The only downside to Savestate is its only uploaded once a week. Still Savestate is the high point of my Wednesday. Got a vote from the dragon here as well. I really enjoy reading your comic and the artwork is really up with the best webcomics.